Damn. Today I pressed my luck and got The Face from John. In retrospect, I should have recognized how risky it was to try to replace his beloved barbeque potato chips with homemade kale chips. John has eaten potato chips with his lunch pretty much every single day since he was old enough to chew, so I shouldn’t have underestimated his resistance to disrupting his lifelong routine, nor his undying love for Lays. But a lady I met in line at the Farmer’s Market went on and on about how much her picky, fast-food loving children love kale chips and beg her to make the chips for them, so figured it was worth a try. I thought: “Hey, kale chips are crispy and salty too, so maybe he won’t notice!” Plus, they’re nutrient-rich and have a wonderfully unique flavor. He should love them, right? WRONG. Oh well, I guess that means more kale chips for me! Since the vast majority of people who try kale chips love them, I’ll still include the recipe just in case you’d like to try it, too. If you try them, please post a comment to let me know how you like them. 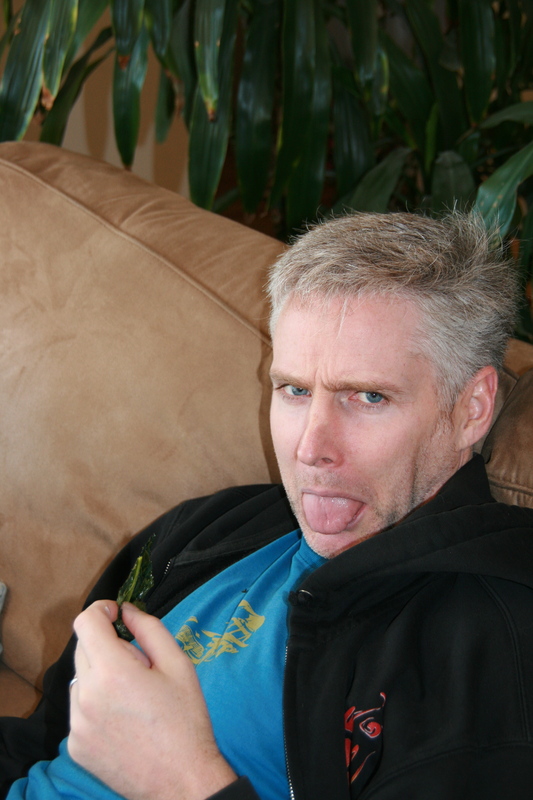 But if you’ve got a die-hard potato-chip lover like John who you’re trying to convert into being a kale chip fan, prepare yourself for a potential face-off with The Face! * Smoked sea salt imparts an incredibly smoky flavor that is just simply delicious. I get mine from www.SpiceHound.com. Preheat oven to 300 degrees. Completely dry the kale – this is essential or else it won’t turn out crispy. 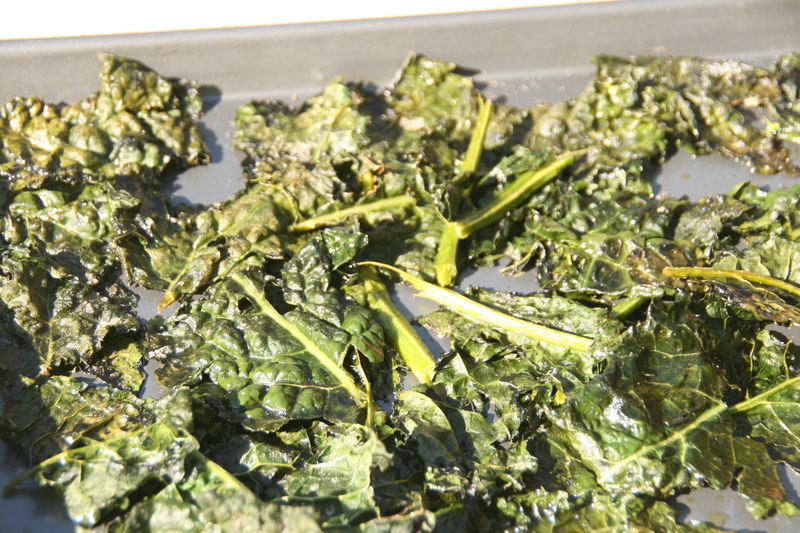 Toss kale with olive oil and spread out in single layer on a cookie sheet. Sprinkle with salt. If using lime or chili powder, sprinkle it on sparingly. Cook for 20-25 minutes or until kale is crispy. If using brown sugar (which creates a lovely and subtle salty-sweet flavor), sprinkle it on after removing the kale chips from the oven. Cimeron Morrissey is an award-winning magazine writer who writes about her passions, which include travel, water sports, animal rescue and food. This is Operation Carnivore Conversion, an ambitious and potentially hazardous project to transform my meat-loving husband into a vegetarian. Recognizing that his diet was shared by Tyrannosauruses but not by humans who live very long, he has decided - reluctantly - to try to dramatically reduce his consumption of animal-based foods. The success of this project relies on my ability to serve inventive and tasty meals that would satisfy even a femur-gnawing caveman (and to prepare them in less than 30 minutes since I don't have much time). This is a high-risk endeavor. If my husband feels deprived or underwhelmed, he will see my arms as snack-shaped objects and/or whine me to death. Failure is not an option. Oh boy, here we go! Lol kale and kale chips aren’t for everyone, and you’re right – pattern behaviour can be so hard to shake even if the person likes something new they come across they usually don’t change unless pushed to an extent, even if they prefer the new item. Have you tried kasava chips? Depending on where you live they could be available in stores too. They’re not as nutrient rich but they’re more similar to potato chips. My fave has to be plantain chips though – with chilli powder – sooooo tasty! Oooo, great idea about the plantain chips – John tried them when we were in Costa Rica and he loved them, so I am totally going to make these with chili powder. Thank you so much for the idea! And thanks also for the kasava chip idea – I’ll definitely try to locate those as well. Let’s hope I don’t get The Face again! summer solstice quotes: The solstice sunrise marks the longest day's the year in the Northern Hemisphere. Time for a Yummy Vegan Picnic!